NASA might be having a rain-check on its outreach activities, but that’s not why Curiosity has gone silent the last few days. Every once in a while an event known as the Mars Solar Conjunction places Mars’ orbit directly behind the sun with respect to Earth, and makes communications impossible. Transmissions have ceased until May 1st, when the red planet will pop back into digital sight. Until then, Curiosity is working on the ‘B-side’ (like the cool side of the pillow) of its systems and operating autonomously. 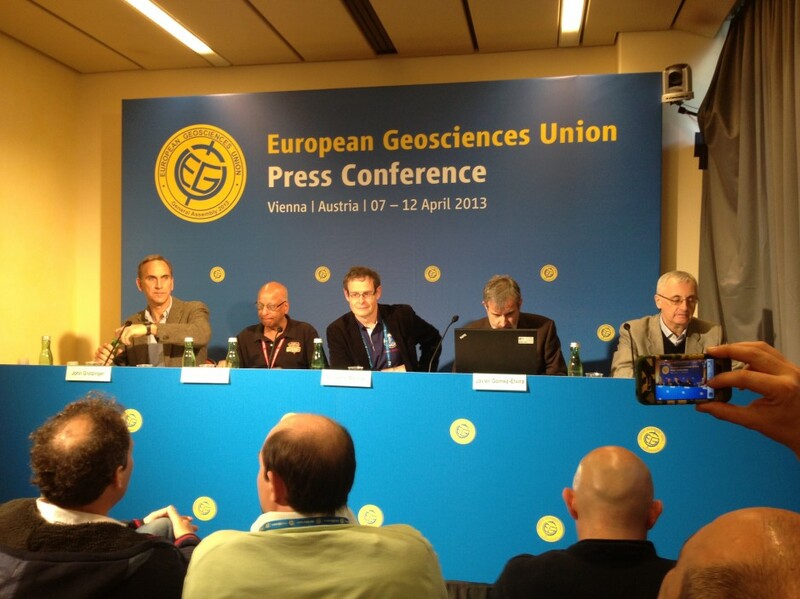 In the mean time, I’ve been fortunate enough to be at the MSL (Mars Science Laboratory) Press Conference here in Vienna, with the latest from the little (1 tonne) science-savvy robot. During the current down time, it’s a chance for the teams to begin to really process the data and get the science out there (see here for where Curiosity has got to so far). This is a snippet of what to expect in forthcoming publications. Curiosity is equipped with a lethal plethora of analytical weaponry, from the ChemCam chemical analyser, to the RAD radiation sensors. The ChemCam operates by firing laser bursts at samples of either dust or rock, and analysing the plasma released from the superheated materials (plasma is a partially-ionised gas that gives off a diagnostic spectra pattern depending on the bulk geochemistry of what you’re analysing). 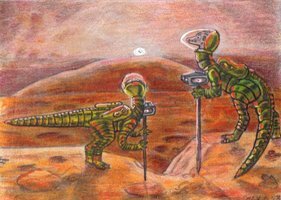 To date, Curiosity has been trigger-happy enough to fire off around 40,000 shots at various inanimate targets (no Martians) to sniff their fumes and determine their chemistry. These laser shots actually have a secondary function too, and that’s to blast away the perpetual dust covering the rocks, like some sort of Martian maid shockwave-service. GCMS, or gas chromatography-mass spectrometry, is a way of identifying the substance chemistry in samples and the relative proportions of those substances. It detects the atomic mass of samples that have been vaporised (there’s a liquid version too called LC-MS) and can measure the relative concentrations. 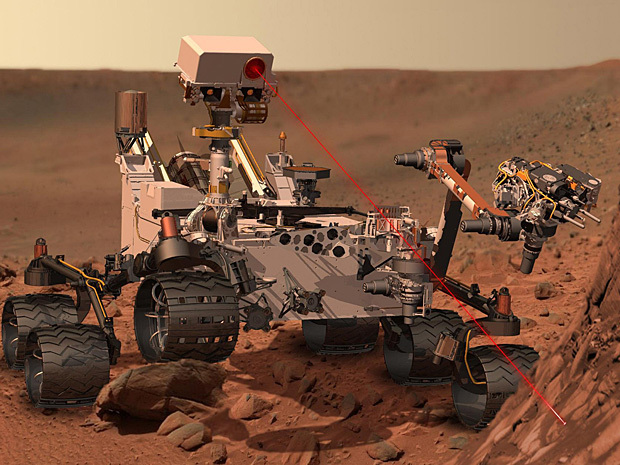 The latest GCMS analysis done by Curiosity on clay samples detected water, perchlorates, carbonates, and both oxidised and reduced sulphur phases, which all point towards the presence at some point of a free-fluid phase. This is important, not because it shows evidence of life, but because it shows that the habitable conditions for certain types of organic life were once present on Mars. The origin of the carbon in these samples is still a bit of a mystery, according to Atreya. SAM (Sample Analysis on Mars, which the GCMS is part of along with a quadrupole mass spectrometer and a tunable laser spectrometer) on a different sample aimed to measure the relative isotopic ratios in Martian argon (they have a heavier and a lighter version). The relative depletion of lighter argon isotopes, relative to the primordial level (raw, unmixed gas concentrations, determined from analyses of the sun and Jupiter), indicates that throughout geological time, Mars has actually lost quite a bit of its early atmosphere, as the lighter isotopes have not been constrained by gravity and simply floated off. Sushil Atreya (SAM co-investigator) said “We found arguably the clearest and most robust signature of atmospheric loss on Mars”. Other analyses all told a similar story, as carbon and oxygen isotopes were all enriched in heavier isotopes too. In all, estimates indicate that 85-90% of the original argon are gone. (what?). The DAN (Dynamic Albedo of Neutrons) analysis, where albedo is sort of like the reflective ability of particles, showed that neutrons of hydrogen atoms (either molecular in water, or as a hydroxyl phase) changed state in a way that allows you tell the dose of radiation from emission. In a dual role, the analysis also allows you to measure the hydrogen content of any subsurface water particles. The DAN analysis from multiple locations seems to indicate a trend of increasing water content with depth (water can be intra-particulate in a structurally bound state, as well as in a free fluid phase or gas). The next steps will be to test enrichment levels of methane within the groundrock, which will provide evidence for the evolution and state of organic compounds. Slightly more interesting than the state of hydrogen, but not as cool as finding a Velociraptor there. (although see this article). Can fossil mammals help us with our conservation efforts?